Start planning your December getaway! The autumn colours have made these colder days ever so lovely but slowly the winter is closing in. Temperatures will start to fall and before we'll know it, we'll be celebrating the New Year. No matter if 2016 has been good for you so far, the good news is, we have more than a month to make the most out of it. And what could be better than a relaxing trip in good company? Many agencies and low-cost airlines are already offering cheaper travel arrangements and getaway weekends in December. Even the shortest trip should be organized in advance so you can make the most out of it and here is some advice on what not to miss in December. Frankfurt is known in December for one thing: the smell of cinnamon, nuts, gingerbread and mulled wine. The famous Frankfurt Christmas market will open in two weeks’ time and last all the way to December 22. Wondering through the streets covered in thousands of lights and wooden chalets, laden with holiday goods will not leave you disappointed. The legendary market is stretching along the city centre and hosts more than 200 wooden stands where you can buy all the Christmas goods you can think of while enjoying the pristine Christmas spirit. Don’t forget to stop by the chalets that are selling locally produced items like wooden toys. And don’t miss out on tasting the local food and beverages like the typical spicy cookies called Brenten, the marzipan pastries Bethmannchen, baked apples and gingerbread. You can reach Frankfurt from Ljubljana, Zagreb, Milan Malpensa, Venice Marco Polo and Treviso Airport. It may not be the most original travel idea but if you haven’t experienced London in Christmas time, you need to get on the plane and fly there this year. You can choose the more luxurious version of England’s capital and cruise around the elegant stores like Harrods, Whitley’s and Selfridges, or go for the more budget friendly getaway. Either way, London is the “par excellence” for Christmas shopping. The English accent combined with a pint of beer, the decorated shop windows and the lit up streets are just a few of the compelling features of this city in December. And don’t forget, no matter the season, London is still a city with an immense cultural background and more than enough sights to make your weekend magical. You can reach London from Ljubljana, Zagreb, Verona, Milan Malpensa, Venice Marco Polo, Treviso and Trieste Airport. Do you absolutely hate the Christmas kitsch? 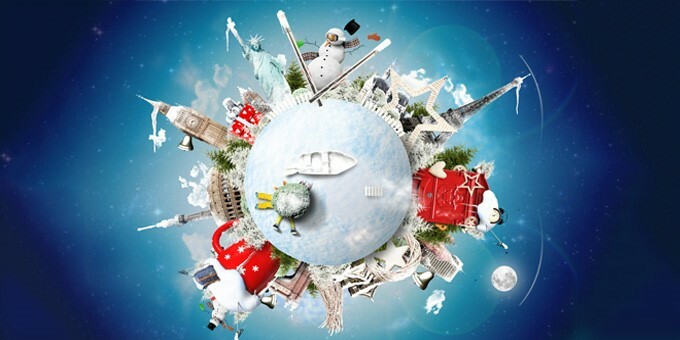 No problem, December is the perfect month to escape the city chaos and travel “outside the box”. If you are already tired of the cold, the best idea for a short vacation is flying off to a town where the climate is (at least a bit) friendlier. On the island of Malta, the temperatures rise above the European average and if you’re extra lucky, you might be able to walk by the sea in your T-shirt. The island that is usually associated with sunbathing on the beach and vivid night life, becomes a popular winter destination for tourists who wish to visit a beautiful destination without spending too much money. The history and beauties of the island get their deserved attention in winter so a visit in the low season could give you the opportunity to discover places full of mystery and charm. You can reach Malta from Zagreb, Milan Malpensa and Treviso Airport. Right after you book your plane ticket, make sure you get an extra convenient and affordable transfer to the airport with GoOpti! And don’t forget, book your GoOpti transfer right after your plane ticket!